CVS Health Corporation (CVS), together with its subsidiaries, provides integrated pharmacy health care services. It operates through Pharmacy Services and Retail/LTC segments. The Pharmacy Services Segment provides a range of pharmacy benefit management (PBM) solutions. The Retail Pharmacy segment includes retail drugstores, online retail pharmacy Websites and its retail healthcare clinics. This dividend achiever has paid a dividend since 1916 and increased it for 14 years in a row. The most recent dividend increase was in December 2016, when the Board of Directors approved a 17.60% increase in the quarterly dividend to 50 cents/share. Pending the company's acquisition of insurer Aetna (AET), the board has stopped the share buybacks and dividend increases. 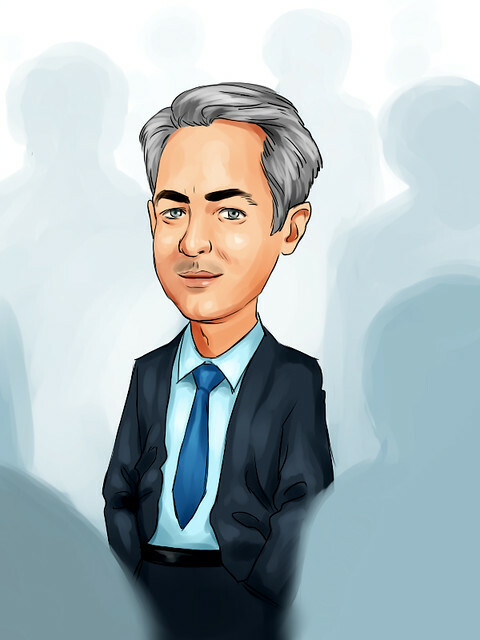 While the company is not going to grow dividends every year, because it will focus on debt repayment, I find its valuation compelling enough to give it preference over Walgreen Boots Alliance (WBA). The largest competitors for Walgreen include Walgreen Boots Alliance (NYSE:WBA), Wal-Mart (NYSE:WMT) and Rite-Aid (NYSE:RAD). Over the past decade this dividend growth stock has delivered an annualized total return of 6.90% to its shareholders. Future returns will be dependent on growth in earnings and dividend yields obtained by shareholders. The company has managed to deliver a 13% average increase in annual EPS over the past decade. CVS Health is expected to earn $6.20 per share in 2018 and $6.72 per share in 2019. In comparison, the company earned $6.45/share in 2017. Between 2008 and 2017 CVS Health has been able to reduce the number of shares from 1.469 billion to 1.018 billion through consistent share buybacks. Pending the approval of its acquisition of health insurer Aetna however, CVS Health has canceled its share buybacks and dividend increases for the time being. Growth in earnings per share could be driven by acquisitions and share buybacks. For example, the company acquired Targets (TGT) pharmacies last year. In addition, CVS acquired Omnicare in 2015. Omnicare is a prescription drug and service provider to the long-term health and specialty healthcare industries. International expansion could also be on the horizon. For example, CVS acquired Brazilian company named Drogaria Onofre in 2013. CVS Health recently announced its intention to acquire the third largest health insurer Aetna (AET) in a deal worth $66 billion. A large portion of this deal would be financed by debt in the tune of $40 billion offering. This deal could provide vertical integration for CVS Health, as it would be able to offer health insurance, pharmacy benefit administration and management, health clinics and drugs to Aetna's 22 million insurance holders. The acquisition could transform CVS Health into one of the most powerful players in the healthcare field. The deal does come at a high price, which means that there is a low margin of safety should CVS Health fail to integrate Aetna into its corporate structure. The company fills more than 1.30 billion prescriptions per year, in its more than 9600 locations in the US. This provides significant scale for CVS, a competitive advantage, which reduces cost per prescription. Pharmacy prescriptions account for over 70% of sales per year. Third parties pay for almost the whole prescription amounts. In addition, the company is able to obtain cost advantages, by getting preferential pricing from suppliers. Payers utilize services of Pharma Benefits Managers such as CVS, in order to control costs – the scale in claims processing and preferential pricing with suppliers is definitely a plus there. CVS also health clinics, and is expected to reach 1,500 of them by 2017. Long term demand for healthcare is only going to increase, as the population increases, and a larger portion of the population is aging. A potential risk for healthcare companies includes the risk of repeal for the Affordable Care Act. This would result in the loss of insurance for approximately 20 million people, which could reduce demand for healthcare. A second risk includes consolidation with its suppliers, which could reduce CVS’s pricing power. A third risk for CVS is increased competition, and reimbursement pressure headwinds. The largest risk is that CVS Health ends up overpaying for Aetna, and it doesn't integrate it successfully. This could result in increased costs, and failure to grow profits. Increased debt due to acquisitions is a top reason why certain dividend growth stocks stopped growing and even cut dividends. 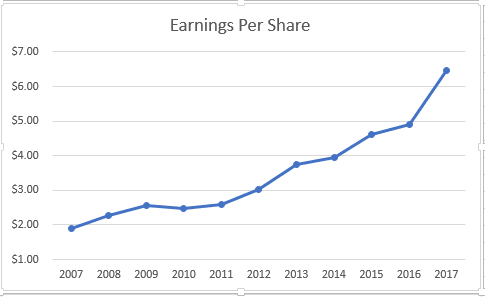 The annual dividend payment has increased by 24.20% per year over the past decade, which is lower than the growth in EPS. This was achieved due to the expansion in the dividend payout ratio. Dividend growth over the next decade could likely exceed growth in earnings per share. 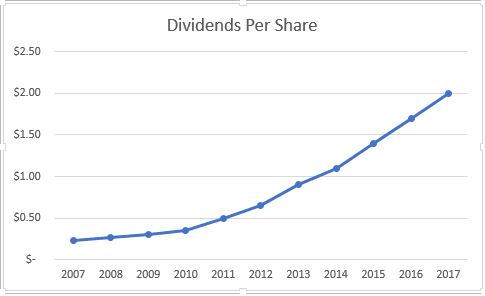 A 25% growth in distributions translates into the dividend payment doubling almost every three years on average. 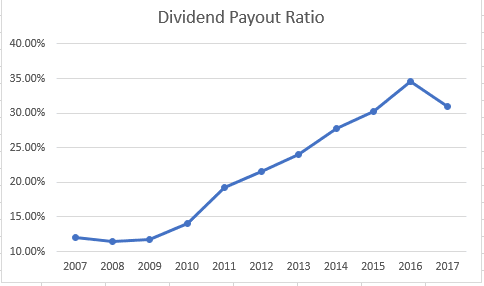 If we check the dividend history going as far back as 1996, we could see that CVS has actually managed to double dividends almost every five years on average. In the past decade, the dividend payout ratio increased from 12% in 2007 to 31% in 2017. I believe the payout is sustainable. A lower payout is always a plus, since it leaves room for consistent dividend growth minimizing the impact of short-term fluctuations in earnings.